Kuala Lumpur, Malaysia – While he was prime minister, Najib Razak was often accused of being woefully out of touch with ordinary citizens’ lives. But now, out of office and facing dozens of criminal charges in connection with an extraordinary multibillion-dollar scandal at Malaysia’s 1MDB state investment fund, he seems to be reinventing himself as a man of the people. Gone are the Italian-cut suits with their carefully-coordinated ties and pocket handkerchiefs. 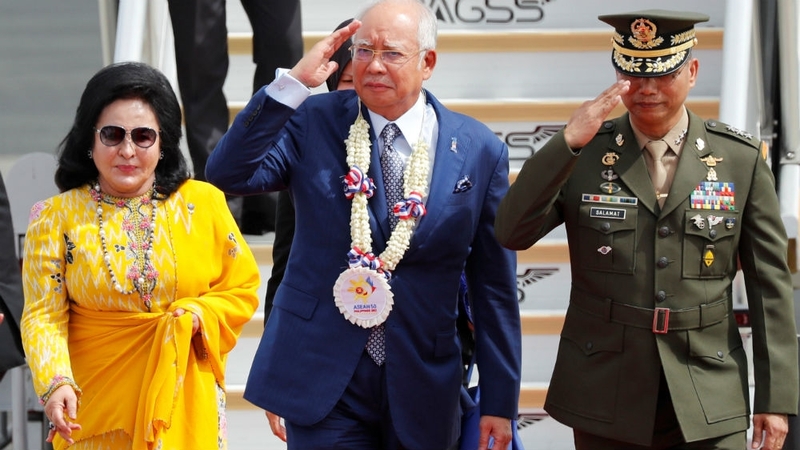 His wife, Rosmah Mansor, in her tailor-made traditional silk outfits accessorised with diamond jewellery, is nowhere to be seen. These days, Najib, rocking a hoodie and kicks, is hanging out with young bikers, riding pillion on the back of a moped. Every moment is shared on his social media accounts and captioned with the slogan: Apa malu bossku? (What’s there to be ashamed about, boss?). There’s even a range of t-shirts. Najib’s new look comes as the prosecution prepares to lay out its case against the 65-year-old in the Kuala Lumpur High Court on Tuesday, the first time a Malaysian leader will be in the dock on criminal allegations, including money laundering, bribery and abuse of power. The United States’ Department of Justice says that $4.5bn was siphoned from 1MDB to fund anything from luxury apartments to expensive jewellery – and even the Hollywood film, Wolf of Wall Street. Some of the money from the sovereign wealth fund, which Najib set up in 2009, is alleged to have ended up in the former prime minister’s personal bank account. “It’s actually classic populism,” Meredith Weiss, an expert on politics in Southeast Asia at the University of Albany in New York who travels regularly to Malaysia, said of Najib’s public persona in the lead-up to the trial. The scale of the corruption at 1MDB was one of the reasons for May 2018’s election shock, which propelled the opposition Pakatan Harapan into government – the first defeat for Najib’s party, the United Malays National Organisation (UMNO) and its Barisan Nasional coalition in six decades. Malaysians watched agog last year as the police wheeled out shopping trolleys laden with designer handbags, bags of cash and expensive jewellery from properties linked to Najib and his family. Investigators later revealed the haul was worth as much as $273m. It took 22 people, six counting machines and three days to count all the cash, which came in 26 different currencies. Najib has denied any wrongdoing. In an interview with Al Jazeera’s 101 East programme last year, he said he was not aware of what was going on at the fund even though, as the country’s prime minister, he chaired 1MDB’s board of advisers and, as its finance minister, was authorised to sign off on its major financial transactions. In a song he released over social media in January – a re-working in Malay of The Manhattans soul classic ‘Kiss and Say Goodbye’ – he accused the government of spreading lies and wanting revenge. Born in July 1953 in the sleepy, rural town of Kuala Lipis when Malaysia was still Malaya and a British colony, Najib was the first child of Abdul Razak Hussein, the man who would go on to become independent Malaysia’s second prime minister. His uncle would become the third. Like many children of the country’s elite, then and now, he was sent overseas as a teenager, first attending Malvern College – one of Britain’s most expensive private schools – and later doing a degree in industrial economics at University of Nottingham. But in 1976, Razak died and Najib was thrust into politics, taking his father’s old seat in Pekan, a small town hugging the banks of the Pahang River on Malaysia’s east coast. Buoyed by his father’s reputation, Najib’s political rise was assured: the youngest member of the federal parliament soon became, at the state level, the youngest chief minister. “He came into politics at a very young age – he did quite well as a chief minister even though he was the youngest [and] many people really liked him,” said Saifuddin Abdullah, who worked alongside Najib in UMNO and government before resigning from the party in 2015. “You can easily like him. He has very good PR, there’s no doubt about it,” added Saifuddin, who is now Malaysia’s foreign minister. After stints as education minister and defence minister, Najib became deputy prime minister in 2004. He took the top job five years later, vowing to build an economic and politically dynamic Malaysia, and double income per person to $15,000 by 2020. The plan aimed to diversify the economy beyond natural resources into areas such as green energy and technology, and reduce subsidies. Politically, the focus was supposed to be on the removal of repressive laws that allowed for detention without trial and strengthening democracy. For Saifuddin, it was the promise of transformation that caught his attention. “He seemed to be saying all the right things,” he told Al Jazeera. 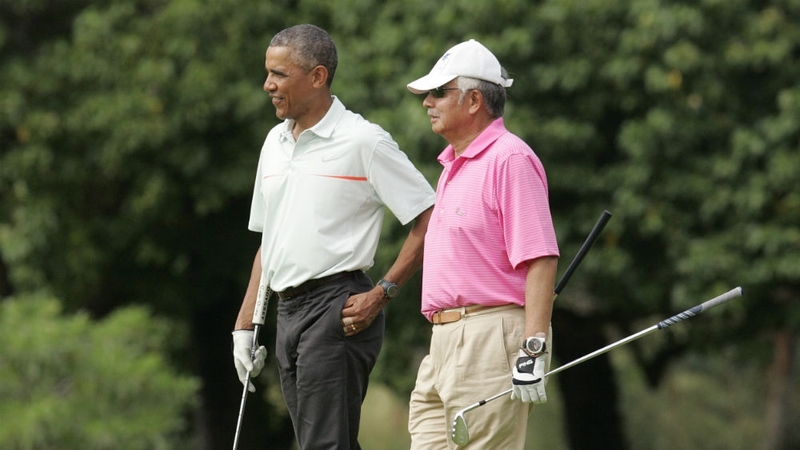 Najib’s urbane manner made him popular on the international stage, and he and Rosmah made frequent foreign trips – rubbing shoulders with world leaders at the United Nations General Assembly, cosying up the tech titans such as China’s Jack Ma and playing golf with ex-US President Barack Obama. Domestically, however, support for the long-ruling Barisan continued to sag. In the 2013 election, the coalition lost the popular vote for the first time, although the winner-takes-it-all voting system magnified by the disproportionate influence of its rural heartlands helped Barisan stay in office. While the reform programme stalled, a goods-and-services tax further undermined support for Najib’s government – but he was about to be faced with an even more serious challenge to his authority. At its launch in 2009, 1MDB was touted as multi-billion dollar investment by a Saudi oil firm PetroSaudi and a remit to target new industries that would create jobs for Malaysians. Later, there were multibillion dollar deals with the United Arab Emirates to develop the massive Tun Razak Exchange development in Kuala Lumpur, as well as bankroll oil and gas projects. But suspicions about the fund’s investment strategy began to emerge, with critics pointing to ballooning debt and asking questions about the fate of funds raised from earlier bond issues. There were questions too over Najib’s stepson, Riza Aziz, and how he had got together the money to make the Wolf of Wall Street, a 2013 tale of financial excess and debauchery with Hollywood superstar Leonardo di Caprio as the lead. Suspicions also focused on a young party-loving Malaysian financier who was often seen with Riza and whose name was in the film’s credits: Jho Low, whose whereabouts are currently unknown. As the story gathered momentum, and pressure mounted, Najib launched an investigation. But then came the bombshell. The campaigning blog Sarawak Report and the Wall Street Journal reported that hundreds of millions of dollars had been deposited into Najib’s personal bank account shortly before the 2013 election. Najib denied ever receiving money “for personal gain”, saying it was a donation from a Saudi prince that was then returned. But on the defensive, the prime minister revealed there was a harder edge to his seemingly charming public image. In July 2015, he stunned Malaysia by firing the attorney general who had been leading the 1MDB investigation and removing senior ministers who had questioned him over events at the fund. The Edge, a local business publication that had reported extensively on 1MDB was suspended for three months, while access to Sarawak Report and other critical sources was blocked. Opposition politicians who had raised concerns about 1MDB found themselves prevented from leaving the country and critics found themselves facing charges under the sedition law Najib had earlier promised to repeal. For Oh, the political analyst, Najib could often seem “cold and detached,” but he was also a “good listener” who was comfortable with figures and charts. Najib insists that when it came to 1MDB, he was not aware of what was going on. In October 2018, he told Al Jazeera’s 101 East that he was proud of what he had done as prime minister and would be vindicated. Najib faces nearly 40 counts; Rosmah around 20. Former allies are also due in court on corruption charges. With appeals, the cases could take years to grind their way through the courts, keeping Najib in the spotlight even without his regular social media updates. But history is likely to prove a more demanding judge than the bikers in their “bossku” shirts.